Polytar Scalp Shampoo is a thick, coal-tar based shampoo that soothes irritated skin on the scalp, reducing itchiness, scaling, and inflammation. These symptoms are often experienced by people with scalp psoriasis or other related skin conditions such as eczema. In these cases, a specially formulated shampoo is required, as standard shampoos often contain irritants that make the condition worse. 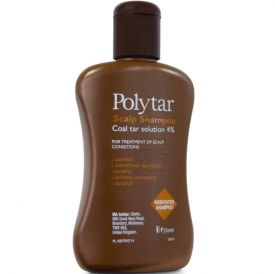 Coal tar is proven to provide relief for psoriasis sufferers. It is a thick oil that works on patches of inflamed red skin covered in scales. It moisturises and nourishes the skin to reduce scales and dandruff, and soothes it to make it feel less itchy. 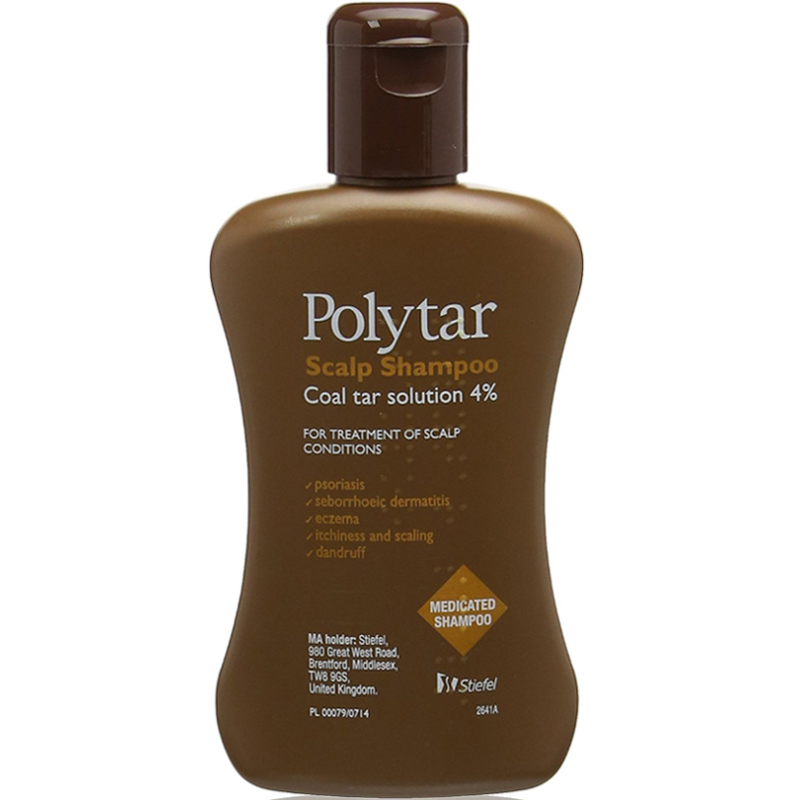 Polytar Scalp Shampoo should be used by adults and children over the age of 12, once or twice per week for an initial period of 4 weeks. First, wet your hair and then massage a small amount of the shampoo into the scalp and any affected areas nearby, using the fingertips. After it has lathered, rinse the scalp well. Repeat this process, ensuring that the shampoo is in contact with scalp for around 3-5 minutes in total over the two applications. For use for longer than a period of 4 weeks, consult a doctor and use as directed. Coal Tar Solution 4%, Sodium Lauryl Ether Sulfate, Cocamidopropyl Betaine, Disodium phosphate dehydrate, Citric Acid Monohydrate Benzyl Alcohol, Macrogol 150 Distearate, Hexylene Glycol, Oleyl Alcohol, Polyquaternuim 10, Fruiter Timotei Fragrance, Purified Water. Helps keep with psoriasis and eczema and also dandruff. Can dry out the hair. I used this all through my teens and early 20s due to having psoriasis on my scalp and also exzema around my hairline and ears. This has a string scent due to the cold tart but after a few weeks using it 3 times a week you get used to the scent. It works really well to reduce flakes and also helps to clam the psoriasis and also helps to soothe any flare ups and soreness on the scalp. When i used this i was suffering bad with splitting behind my ears from the exzema and also around my neck. This helped to stops the exzema break outs and let my skin heal. The one thing i dont like is that it really dries out the hair and makes it feel like straw. I found that it was essential to use a good moisture-rich conditioner and also one that revives the hair like Herbal Essence or Pantene and l'oreal Elvive. 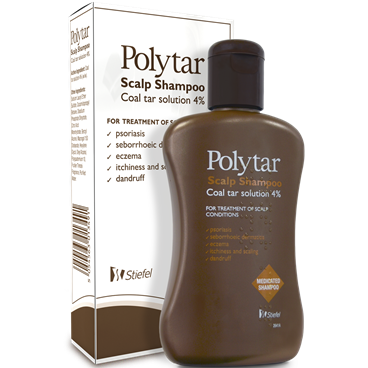 These were what i used to keep my hair looking good and they also help to hide the scent of the polytar shampoo. A good conditioner to use now is the new Herbal Essence Bio Renew Repair Argan Oil of Morocco shampoo and Conditioner, This is amazing and gives the hair a new lease of life. Scalp was 50% better after first use. By third use, scalp conditions had gone. Easy to use, lathered up well. Price is good for what it is. The scent is awful and lasts the whole time. This product is amazing, recommended by a pharmacist as I have contact dermatitis and my scalp happened to flair up. Got rid of the dryness, soreness, itchiness and redness. Also was left flake free. The scent though, is the worst thing ever and you can smell it everywhere, I would recommend tying hair up after use until your scalp is clear. Very effective and worth the awful smell if you scalp is in a really bad condition. Hair actually looked really nice and shiny.